His follow-up to the noir classic Kiss Me Deadly, director Robert Aldrich returned with 1955’s The Big Knife. Taken from Clifford Odets’ play, the film introduces us to movie star Charles Castle (Jack Palance). To outsiders, Castle appears to enjoy a great life, but fissures emerge. Castle’s wife Marion (Ida Lupino) plans to divorce him unless he leaves Hollywood while studio chief Stanley Shriner Hoff (Rod Steiger) threatens to blackmail him if he doesn’t renew his contract. These competing concerns send Castle into a spiral. 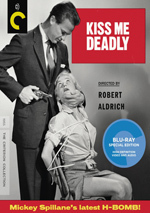 Given that I really liked Kiss Me Deadly, I went into Knife with high expectations – mostly. My hopes became hampered by the fact Knife boasts much less “name recognition” than does Deadly - while popular notoriety doesn’t guarantee quality, it doesn’t seem unreasonable to assume Deadly maintains a higher profile for a reason. I think the reason for this discrepancy is the difference in quality between the two. While Deadly offers a taut thriller, Knife winds up as a meandering collection of monologues. As noted at the start, Knife adapts Clifford Odets’ play, and its stage-bound origins seem obvious. Other than a couple of brief detours, the vast majority of the story takes place in one part of Castle’s house, and this restricted nature forces the movie to go down unnatural paths. Essentially Knife consists of little more than sequences in which one Castle friend/associate after another comes to him and yammmers. Rather than integrate into the narrative, these scenes tend to feel like short speeches: the participants arrive, say their highly-scripted lines and leave. It doesn’t help that the story never makes it all that clear what makes Castle’s life in Hollywood so miserable. He seems horribly unhappy but the narrative fails to give us a compelling rationale – because Hoff forced him to make some crappy movies? Boo-hoo – you’re breakin’ my heart! That adds to other factors that mean Castle becomes a less than sympathetic lead – and also not one who ever seems especially interesting. The movie hints at an active internal life but this doesn’t develop in a convincing manner, and the various ways the story ratchets up the drama also lacks a real sense of believability. Knife tends toward broad melodrama, and the actors overplay their parts. Some do worse than others – Steiger and Shelley Winters gobble scenery with abandon – but few seem appealing in their roles. All of this makes Knife a real disappointment. Self-pitying and morose, the movie drags and never involves the viewer. The Big Knife appears in an aspect ratio of approximately 1.85:1 on this Blu-ray Disc. This was an acceptable but erratic image. Sharpness became a largely positive element, as the movie mostly displayed good definition. Occasional soft spots emerged – like a scene on the beach – but the majority of the film offered appealing delineation. I saw no signs of jagged edges or moiré effects, and the image lacked edge haloes. In terms of print flaws, I noticed a few small spots but nothing substantial. Knife did seem grainier than expected. Blacks were dark and dense, while shadows seemed clear and smooth, with good contrast. This was a decent but not great image. I felt less happy with the dated LPCM monaural audio of Knife. Dialogue remained intelligible but the lines could show edginess and sound somewhat brittle at times. Music played a fairly small role in the proceedings and seemed fine with quieter bits, but louder bursts demonstrated shrillness. Effects had little to do in this chatty film, so they offered acceptable clarity. Knife came with a noisier than expected track. Popping and crackling appeared at times, and I also noticed occasional bouts of static. For its age and ambitions, this wasn’t a terrible mix, but it showed more problems than I’d anticipate. As we shift to extras, we open with an audio commentary from film critics Glenn Kenny and Nick Pinkerton. Both sit together for a running, screen-specific look at the source play and its adaptation, director Robert Aldrich’s career, cast and crew, historical context and cinematic techniques. Kenny and Pinkerton combine to create an informative commentary. They cover a good range of subjects and do so in an interactive manner. We get a solid examination of the film here. A 1977 featurette called Bass on Titles runs 33 minutes, 46 seconds and offers a chat with title credit designer Saul Bass. He discusses aspects of his career, with an emphasis on specific work. Bass gives us nice insights, though much of the running time provides examples of his titles, so we don’t get as much commentary as I’d like. In addition to the film’s traiiler, we locate a period TV promo. It goes for four minutes, 59 seconds as actor Jack Palance introduces us to other cast members. We also get a couple of glimpses behind the scenes. It’s a fun curiosity but nothing memorable. A booklet completes the package. It includes essays from Nathalie Morris and Gerald Peary as well as photos and credits. 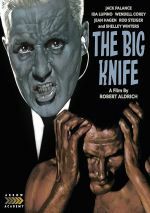 Despite a good array of talent on both sides of the camera, The Big Knife fails to gain traction. It seems self-involved and melodramatic too much of the time. The Blu-ray offers erratic picture and audio along with a couple of useful bonus features. Knife fails to make much of a positive impact.